Horse racing has perhaps the most glamorous image of all so-called animal 'sports' (especially when compared to the visually obvious cruelty of rodeos)... Such is the allure of horse racing that major race-meets such as the Melbourne Cup are even 'celebrated' with public holidays. Socialites spend thousands on designer outfits, the champagne flows, and millions of dollars are gambled on the outcome of races. However, the Black Caviars of the industry are few and far between. What is the life of a racehorse really like? And what of the thousands of horses that fail to 'make the grade'? The 'yearling' sales of thoroughbred colts and fillies draw the 'horsey' crowd — the monied people. Most yearlings sell for tens if not hundreds of thousands of dollars, and the gamble starts right there; with the owners and trainers hoping to 'back a winner' and to have the next great champion, or at least recoup their outlay. The scale of the industry is huge — around 15,000 thoroughbred foals are bred each year in Australia, and a similar number of standard bred foals are born nationally. Racing as a two-year-old puts the horse at particular risk of injury because at this age the skeletal system of these animals is still immature and not ready for the hard training and physical stress of the racing world. Regardless, the lure of the very high stakes for the two-year-old races mean many owners push trainers to have their expensive animals compete. Whilst in training, horses may be individually stabled for most of every day, apart from when they're on the training track. Stabling is the most 'practical' way to provide the horses with their high-performance training and racing diet, and housing them right next to the training track reduces time consuming daily transport. However, without social and environmental stimulation, horses can develop stereotypic behaviours, such as crib-biting (biting on fences and other fixed objects and then pulling back, making a characteristic grunting noise, called wind-sucking) and self-mutilation may occur. These stereotypic behaviours are a strong indicator of welfare problems for horses. Around 31,000 thoroughbreds and a similar number of Standardbreds will be 'in training' or racing at any one time in Australia. The feeding of high concentrate diets (grains) fed during training rather than extended grazing, often leads to gastric ulcers. A study of racehorses at Randwick (NSW) found that 89% had stomach ulcers, and many of the horses had deep, bleeding ulcers within 8 weeks of the commencement of their training (Newby J, Welfare issues raised by racehorse ulcer study, The Veterinarian, March 2000). During training and in competition, horses of all ages can suffer painful muscular-skeletal injuries, such as torn ligaments and tendons, dislocated joints and even fractured bones. 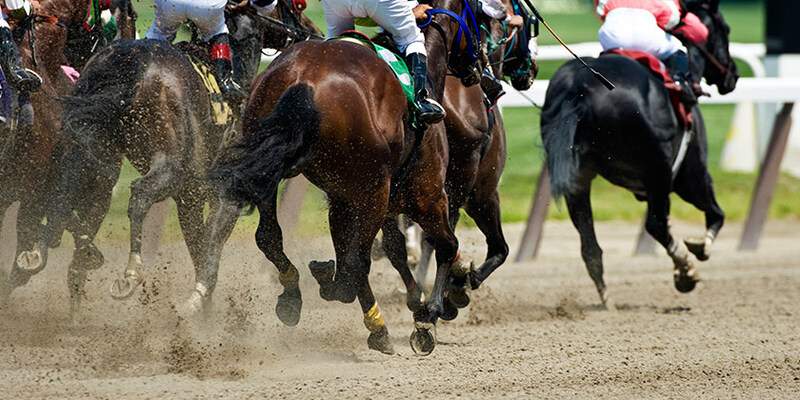 The exertion of the races leads a large proportion of horses to bleed into their lungs and windpipe — called Exercise-Induced Pulmonary Haemorrhage. This has only been fully realized in recent years when endoscopes have been used to carry out internal examinations via the throat. A study carried out by the University of Melbourne found that 50% of race horses had blood in the windpipe, and 90% had blood deeper in the lungs. Jumps racing is one of the many fates for 'failed' and 'retired' thoroughbred racing horses (particularly in Victoria and South Australia). 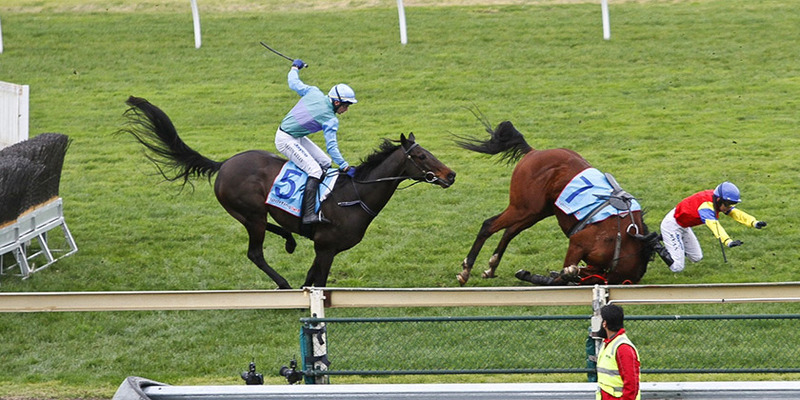 Statistics over many years have shown that jumps races are even more dangerous and harmful for horses, with up to 20 times more fatalities than flat races. This is not surprising when you have a group of horses being pushed to jump a series of one metre high fences together at speed. As well as this, the jumps races are usually much longer, and the jockeys are permitted to be heavier. Tired horses have a greater risk of falling — risking injury to themselves and often the jockeys. The injuries that occur when horses fall or career into the jumps or the barriers can be quite horrific. For more information see Animals Australia's 2008 submission to the Victorian Members of Parliament about why jumps racing should be banned. Why are injured horses almost always killed? This is a question often asked as race-day audiences watch a traumatic fall and then are temporarily upset as a screen is rushed to the track to shield them from the brutal reality of the racing game. When a horse breaks a leg or shoulder the bones may 'explode' into many pieces, making it impossible for a vet to repair the bone, and even when recovery is possible, it is unlikely the horse will be able to race again. Even where a mare or stallion has potential at stud (breeding), the cost of restoring a racehorse to full fitness is expensive, and not a guarantee. Injured racehorses are prone to infections, particularly pneumonia, and are usually deemed uneconomic. You can count on one or two hands the Melbourne Cup winners who now graze on beautiful paddocks in their retirement. Most ex-racing horses are not so lucky. The vast majority of thoroughbreds (flat and jumps racers) and standardbred (harness racers) horses fail to run fast enough or become injured and are just 'discarded' by the racing industry. A study conducted by researchers at the University of Sydney (Epidemiology of horses leaving the Thoroughbred and Standardbred racing industries, by Hayek AR, Jones B, Evans DL, Thomson PC and McGreevy PD — Proceedings of the 1st International Equitation Science Symposium, August 2005] attempted to track ex-racing horses. Similar to other studies they found almost 40% of racehorses leave the industry each year due to poor performance, illness or injury or behavioural or other problems. Many failed or older racehorses will be destined for slaughter, and may go to local knackeries — to be used for pet meat, for example — or be purchased for slaughter at the two horse abattoirs in Australia (Peterborough in SA and Caboolture in QLD). Approximately 2,000 tonnes of horse meat is exported from Australia for human consumption in Japan and Europe annually (ABS figures). Over 25,000 horses per year are killed in this way in Australia. The long distance transport of horses to slaughter for human consumption is not well monitored or regulated. Travel is usually stressful for horses, and research shows that even travel of 6 hours causes suppression of the immune system (an indicator of welfare problems). Horses may be transported for several days to Australia's two export slaughterhouses. Some horses considered unwanted ('wastage') by the racing industry will be sold on for riding, eventing or other uses, but the majority will not be wanted and are likely to be sent for slaughter, either directly through auctions or 'eventually' when they have no further use. The horse racing industry is no different to any other animal industry. It values animals on the basis of financial 'return'. The ethics of any gambling industry are questionable — but when the gamble is with flesh and blood, there will inevitably be very few 'winners' and many losers. The drive for financial and personal success and glory is about return for trainers and owners — not the horses. At best, horses lead an unnatural and restricted life whilst racing, and at worst end up as 'wastage' in an industry that has no more use for them. See for yourself in this behind-the-scenes footage of the horse racing industry. Warning: this video contains some slaughter footage. If you have friends, colleagues or family members who go to the races, please send them a link to this page. It will enable them to make an informed choice as to whether they want to continue to support this industry.